grandma's cookie jar: Reading God's Word Together! specific Bible verses to read each day which their poppa and I are also reading. I believe there is much to be gained from reading God's Word and when we as grandparents are able to do it with our grandchildren, on a daily basis no matter where we all live, it is a truly wonderful thing! 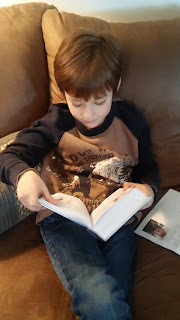 I've been emailing my grandsons the daily Bible verse, along with what I think about the verse and often a fun website for them to check out as well. The other day my oldest grandson said he would like to be the one who emails the daily Bible verse to his poppa and I. It sounded like a good idea - worth trying - so he is not emailing a verse to me each day . . . or most days! If he misses a day, he sends me two verses the following day. I want my grandsons to want to read God's Word. I want them to understand what a gift from God it is to be able to have the Bible. I want them to be people who believe the Bible and hold fast to it throughout their lives. I'm looking forward to seeing what verse he will email to me today!